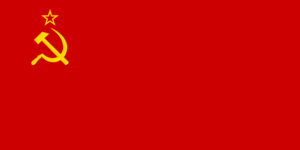 The Red Banner, used between August 15, 1980 and December 25, 1991. The Soviet Union, officially known as the Union of Soviet Socialist Republics (Сою́Russian: з Сове́тских Социалисти́ческих Респу́блик) and abbreviated to USSR, was a socialist country located on the Eurasia continent, which was governed by a single party from the capital Moscow. The country was founded on December 30, 1922 and was dissolved on December 25, 1991. The country had its origins from November 7, 1917, which saw Vladimir Lenin and the Bolsheviks (later renamed the Communist Party) take control of Russia, with the party taking full control of the country in 1922 after a civil war. The Soviet Union was led by Lenin, Joseph Stalin (including during the Second World War), Nikita Krushchev, Leonid Brezhnev, Yuri Andropov, Konstantin Chernenko and Mikhail Gorbachev. The Soviet Union had borders with Afghanistan, China, Czechoslovakia, Finland, Hungary, Iran, Mongolia, North Korea, Norway, Poland, Romania and Turkey. Following the collapse of the Soviet Union, the following countries gained independence: Armenia, Azerbaijan, Belarus, Estonia, Georgia, Kazakhstan, Kyrgyzstan, Latvia, Lithuania, Moldova, Russia, Tajikistan, Turkmenistan, Ukraine and Uzbekistan. The Soviet Union briefly allied itself with Nazi Germany during the early part of the Second World War, known as the Great Patriotic War within the Soviet Union, before joining the Allied Forces, which included the United States, United Kingdom and France. After the war, the Soviet Union had increased their 'sphere of influence' to much of Eastern Europe known as the Eastern Bloc. The countries in the Eastern Bloc included the German Democratic Republic (GDR, also known as East Germany), Poland, Czechoslovakia, Hungary, Bulgaria and Romania, with Albania leaving the bloc in 1960. This led to an increase in tention between the Soviet Union and the western allies, in particular the United States. This tension led to a number of conflicts around the world in an attempt to stop the Soviet sphere of influence increasing, which included conflicts in Vietnam, Cambodia and Laos, South Korea, Nicaragua and Angola among others. A hidden poster showing Mikhail Gorbachev and Ronald Reagan. The Lubyanka neighbourhood of Anywhere City is a reference to the Lubyanka Square in Moscow, which also houses the infamous Lubyanka building, which was used a KGB prison. 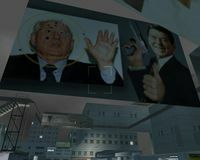 A hidden poster can be found inside the Downtown Ammu-Nation store showing a picture of Soviet General Secretary Mikhail Gorbachev, riddled with bullet holes, next to a picture of US President Ronald Reagan holding a gun. Mike Toreno tells Carl Johnson that the Verdant Meadows airstrip in Bone County used to be owned by Russians. Due to its close proximity to Area 69, it may have been used by the Soviet Union to spy on the secret military base. Mikhail Faustin and Dimitri Rascalov are known to have served in the Red Army. The Perestroika bar owned by Faustin is a reference to the political and economic reforms introduced by Gorbachev in the 1980s, which led to the collpase of the Soviet Union, which are commonly referred to as Perestroika. The Little Gorbachefs restaurant is a reference to former Soviet leader Mikhail Gorbachev. This page was last modified on 10 March 2017, at 20:59.